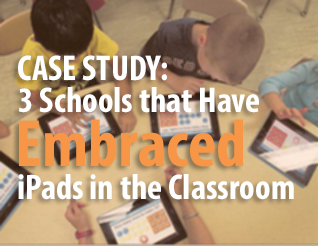 iPads are becoming increasingly present in educational facilities everywhere. Their vast array of benefits like increased collaboration and the ability to bring learning outside of the classroom are hard to ignore. Our world is becoming progressively mobile, so it only makes sense for education to follow the same trend. The use of iPads in the classroom are perfect for the job, it’s like they were made for education. -“We were frustrated because we had a vision of what we wanted, but there didn’t seem to be a good solution,” says Neil Willis, Principal, Longfield Academy. -“iPad takes our learning vision forward. It gives students the freedom to learn in the restaurant, on the bus home, and in their bedrooms as well as in the classroom. Students are more confident and mature learners,” says Alex O’Donnell, Vice Principal, Longfield Academy. - “ iPad gives them much more fun in gathering the information they need, and a much greater variety of ways to express themselves. I see the difference every day,” says Emma Beamish, Engligh Teacher, Longfield Academy. Also Read | "The Future of eBooks: Preparing for Interactive Content in Education"
-"The technology has had a lot to do with their engagement and their learning, “ says Mary Fleegal, Teacher, Northdale Middle School. -"We feel like we've gotten our money's worth,” says Kathryn McLachlan, Speech Language Pathologist, Northdale Middle School. - "We're trying to teach our student how to think," says Steve Appelman, Principal, Mason County High School. - "Having the technology levels the playing field for all students, particularly those who may not have access to a computer at home,” says Kermit Belcher, Technology Director, Mason County High School. Also Read | "The Ultimate Guide to Deploy iPads in the Classroom"
The use of mobile devices in the classroom is ever present and the future of education. If your school is considering implementing a 1-to-1 or BYOD program to bring these fabulous gadgets into the classroom, you may contact us here with any questions or for a free consultation. We have helped schools all over the country and are always happy to help! Good luck!